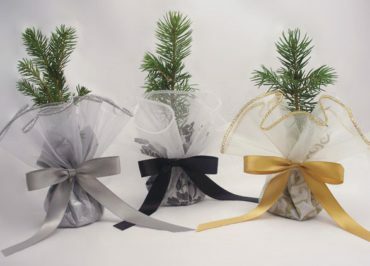 For a more elegant look, choose our Organza Tree. An excellent choice for wedding favors or table decorations. 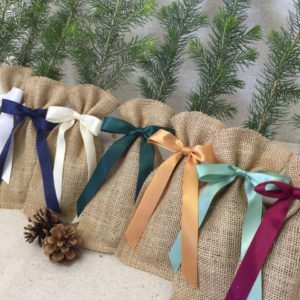 Each favor consists of the half-bagged tree seedling, planting instructions, a 12” organza circle, tissue paper in the color of your choice and matching ribbon. Add a custom 2.5” x 4” card with your own personal message to complete the look. To save $2.00/tree, you may choose to receive as a tree kit to assemble yourself. If your delivery date is within the next two weeks, we will email you by the next business day to verify that we are able to get your trees to you at that time. Please note that for short lead time events such as funerals, we will prioritize your order. Black Hills Spruce - Zone 3-7Colorado Blue Spruce - Zone 3-7Douglas Fir - Zone 4-6Eastern Red Cedar - Zone 2-9Grand Fir - Zone 5-9Meyer Spruce - Zone 2-8Noble Fir - Zone 5-6Norway Spruce - Zone 3-7Serbian Spruce - Zone 4-7West Coast Douglas Fir - Zone 4-6 We will no longer have this species available after June 1st 2019.Western Red Cedar - Zone 6-8White Spruce - Zone 2-7I am not sure, choose the best tree for my environment.I want more than one species. A respresentative will call or email you to verify number. Please enter the total number of trees you want to finish your order. 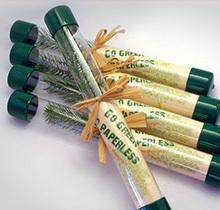 Choosing a tag will add $0.50 per tree. Which border would you like for your tags? Borders shown on Tree Information page. You may enter your own greeting or choose one of ours from the poem list on the Tree Information page. To have a picture or your logo printed on your tag, please email it to us at info@greenworldproject.net. Please enter a number greater than or equal to 50. For orders over 1500 trees, please call the office for pricing at 800-825-5122. For orders over 5000 trees, please call the office at 1-866-825-5122 for a custom quote. Fed Ex ground to your location will take 4 days. For a faster option, please call the office at 1-800-825-5122. A representative will email or call you within 48 hours to determine shipping method and cost to Alaska. Unfortunately, we are unable to ship live plants to Hawaii. A representative will call or email you with shipping costs. These will be billed separately. Due to the variable nature of live products, it is difficult to determine shipping costs until your order is packaged. To fax or mail your order click here for a printable order form.